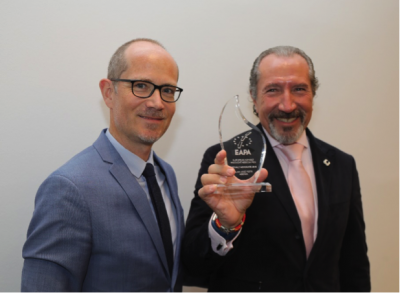 The European Asphalt Pavement Association (EAPA) has awarded Juan José Potti, President of ASEFMA (Asociatión Espanola de Fabricantes de Mezclas Asfálticas), the Spanish Asphalt Producers Association, with the “EAPA Asphalt Advocate of the Year” award during its General Council Assembly in Berlin on 13 June 2018. With this award EAPA honours a member that has demonstrated own initiatives regarding a better asphalt road marketing and the communication of important industry’s topics. The Asphalt Advocate must have supported the “Asphalt Advantages” campaign EAPA initiated together with Eurobitume, the European Association of Bitumen Producers. This award was provided for the second time after 2017. It’s been said of Mr. Potti that he never sleeps, because he is always active in social media (@jjpotti). He talks about asphalt and its benefits, about asphalt industry events, and brings people together on these kinds of “new” platforms. Many thousand people follow him from all over the world. So, he is not only an asphalt advocate, he is also an asphalt influencer. This year Mr. Potti initiated and organised the first International Road Maintenance Day 2018 (#IRMD2018). Under this name he and ASEFMA created a platform to provide good arguments that support the need for proper road maintenance all over the world. This successful initiative will be continued with the second International Road Maintenance Day next year on 4 April 2019. Mr. Potti was together with some other well-known people in the European asphalt industry at the cradle of an activity initiative in the year 2012 that later became the Asphalt Advantages campaign. As EAPA member he is the example of showing how to advocate for asphalt and the asphalt industry as well as how to communicate its needs and the benefits of asphalt. Asphalt Advantages is a campaign jointly developed by EAPA & Eurobitume to promote the advantages of asphalt by providing useful information and credible evidence of the benefits of asphalt in road construction and maintenance. For the fields sustainability, comfort, safety and economy more than 70 advantages have been developed. The campaign ‘informs’ the ‘uniformed’ and helps road users and decision-makers improving their knowledge and awareness of asphalt’s advantages. For this purpose, the website www.asphaltadvantages.com was created and relevant information is shared on social media on Twitter, Facebook and LinkedIn (@asphalt_eu).